Receive a 200% Match Bonus up to $4000 on your first deposit! Use our link and Lock Poker Bonuscode THEFUTURE. 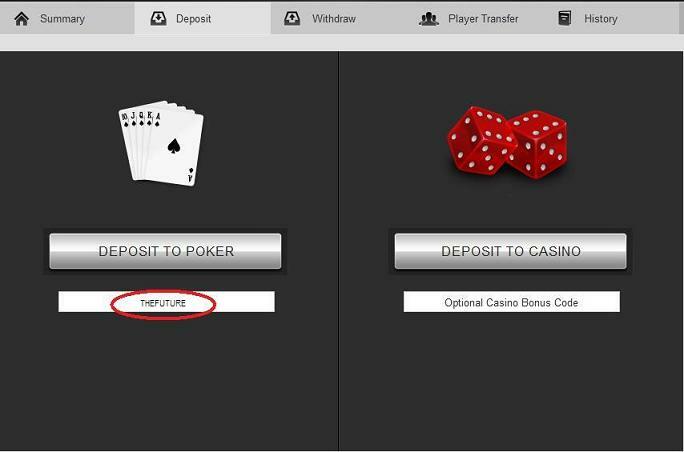 Enter Lock Poker Bonuscode THEFUTURE when making your first deposit. After downloading the software and clicking the cashier button the following screen will appear. Enter the bonuscode THEFUTURE as shown below. Valid for 2012. After entering the bonuscode complete your deposit and the bonus money will be placed in your pending bonus account. As you earn the required points the money will be moved to your real money account. For information on Lock Poker see our complete Lock Poker Review. All new players will receive a 200% match bonus on their first deposit up to $4000 by using any of our links. The bonus is released in $5 increments after earning 84 VIP Points. You earn 1 VIP Point for $1 paid in rake and 7 points for every $1 paid in tournament fee's. This equates to earning $1 of your Lock Poker bonus for every $2.38 paid in fee's or rake making it the easiest poker bonus to earn.